I was invited by Bayer during the Innovfest 2018 held over at Marina Bay Sands this week to check out on their latest efforts. To be frank, it is not exactly in line with what the Innovfest is about and the focus for this trip is actually about games. Yes, you heard right. Bayer, one of the biggest biochemical/Pharma firms from Germany has introduced App based Games for the masses. Bayer launched the From Molecules to Medicine (FMTM) ‘serious games’ to show to the masses, how drugs and medicine come to being, from deep research into the medical problem, clinical trials and filing of paperwork to ensure the drug meets the legal criteria before putting it up for sale. I actually played the game, finding anomalies within the DNA double helix, sending people to different stages of tests and doing ‘filing’ for the new drug. I find it kind of odd that Bayer decided to put in some ‘serious’ monies to develop the ‘serious’ game. The answer I got was about educating the public and hopefully, more kids will be interested to take up work as a researcher. The FMTM game is not exactly at the same level with some medically themed computer games. I remembered one where I used the Nintendo controllers to cut open a patient and proceeded to operate on the said patient. It was interesting because it was so hands-on. To have that kind of level of entertainment won’t be easy and to actually use the game to instil interests in the young minds to become scientists, I think it is a bit far-fetched. But still, I can’t deny the fact that Bayer has its heart at the right place – to get more people into the field and it means more potentials to find the cure. However, the reality is not that easy for researchers. R&D is not exactly something one can do for short haul gains and usually, it is for the long haul and it does take a certain type of personality to have that gumption and determination to see through a project from thesis to the actual product. As usual, most people will go the easy way to earn the easy money. I have to say the game has to be part of a bigger picture. I would think it should be at a place where Bayer is part of an educational program to showcase different careers while the kids are at Secondary Schools where the teenage kids still do not know why we must know 2 hydrogen molecules merged with 1 Oxygen molecule to form water. It is as if we have tanks of Hydrogen lying around where I can burn and form water in order to survive. If you must know, I failed Chemistry miserably. 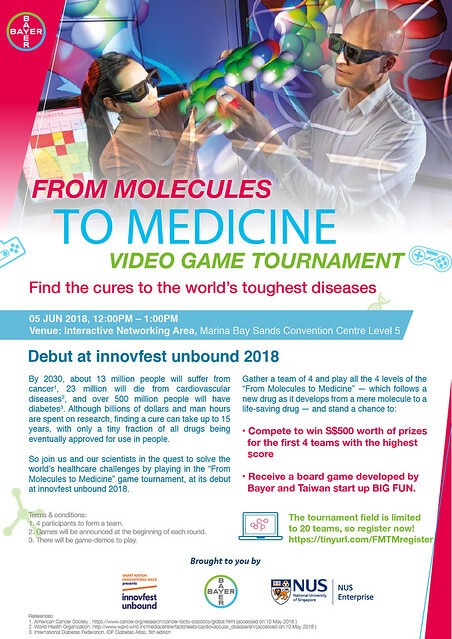 At least Bayer has used games to educate people and hopefully lead to more people going into the field of medical science, research and development. The FMTM game can be downloaded at Apple Store. Android? No such luck. That is an anomaly that needed to be fixed!